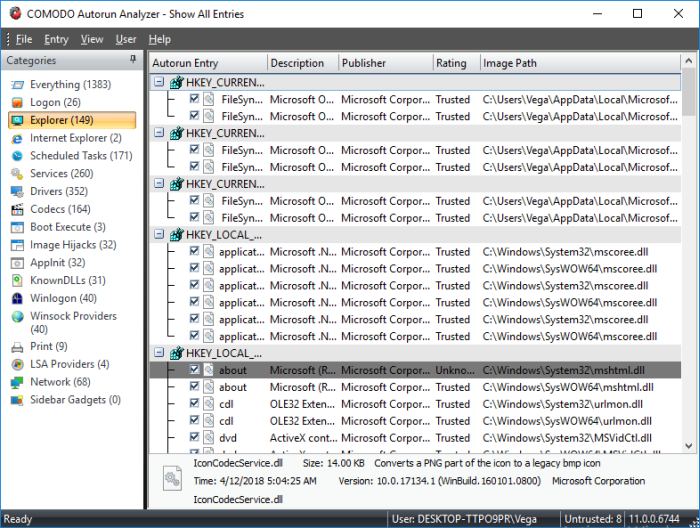 All autorun entries are shown in a tree structure with their description, location, publisher and threat rating. Untrusted autorun entries are highlighted for easy identification. You can filter entries by category (left-hand pane), and by the user that started them. Right-click on an item to perform additional actions. Or select an item and click 'Entry'. The name of the startup item. A brief explanation of the entry. The software vendor that released the parent application. The result of the scan performed on the item by Autorun Analyzer. Items identified as untrusted are highlighted for easy identification. The installation path of the patent application or the loaded module.